Adirondack chairs are extremely comfortable. There are many variations of this type chair, but they all share the same high backrest, angled seat and wide armrests that make them a comfortable spot to spend a long lazy afternoon. 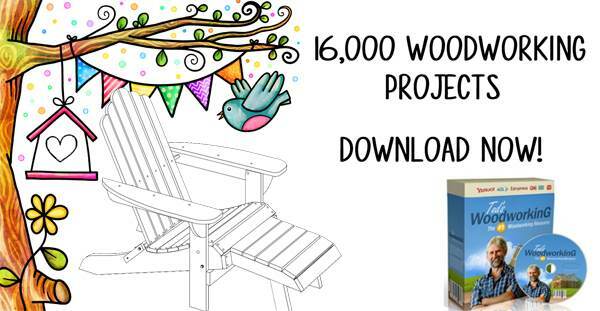 Build an Adirondack chair using a variety of woods to blend with your outdoor furniture or painted to add a spark of color to the patio or deck. Finish it off with custom or purchased cushions to give a decorator touch and added comfort. Outdoor chairs are easy-to-build, and many of these plans come with videos and helpful hints on construction. Choose teak, cedar or redwood for beautiful, long lasting durability or select stock lumber and add your own stain or paint. 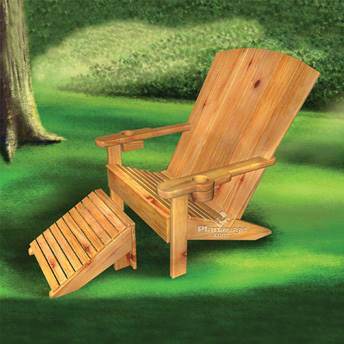 Some of these Adirondack chair plans have footrests or loveseat models to add versatility to your seating. 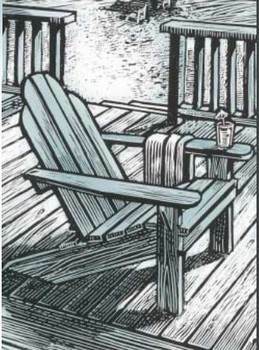 Here is a plan for the perfect Adirondack chair. The instructions are in step by step format with each step is demonstrated in a diagram. Also included are woodworking tips to make building the chair easier and less time consuming. 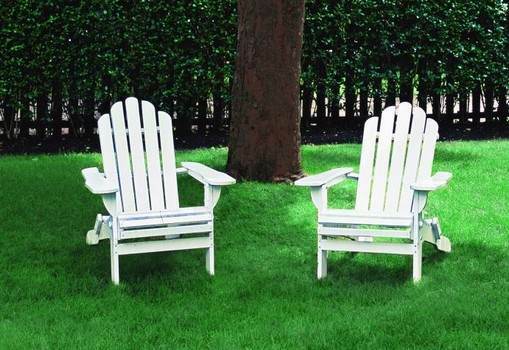 Create a stylish chair with a somewhat different backrest than a standard Adirondack chair. 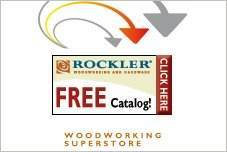 Here you will find a list of tools, needed materials and a cut list. Paint or stain the chair to your liking. This child's chair is designed to be strong and sturdy, and it has a built-in cup and umbrella holder in the armrest. There is also a footrest that can easily be added. 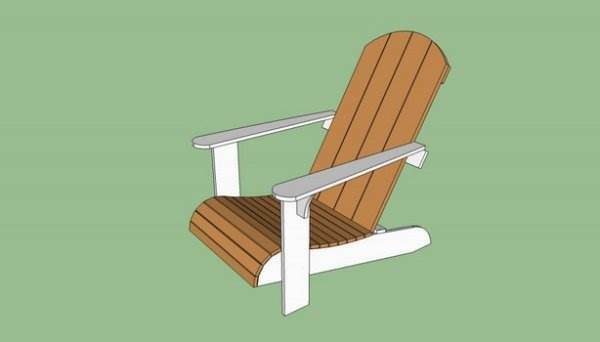 Build a long-lasting Adirondack chair with wide armrest and a low-slung seat in a single day when using this well laid out plan. Each woodworking step has its own drawing to illustrate the instructions. 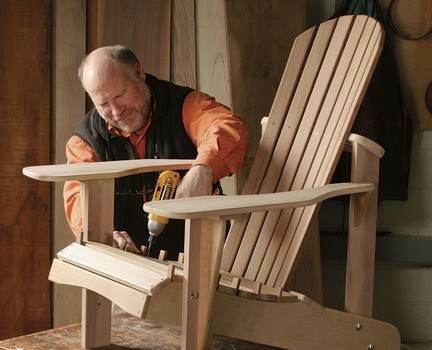 Find out just how easy it is to create an outdoor chair for everyone in the family. 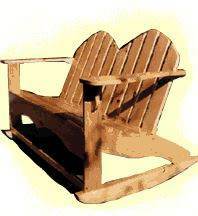 Here is a supply list and plans with pictures to get you started on building one or several Adirondack chairs. 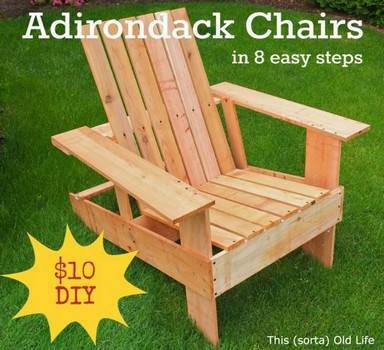 Here are eight basic steps for creating an Adirondack chair. You can customize the chair as you go to your own personal liking and use the wood of your choice. Start making outdoor seating inexpensively and quickly with this eight step project. 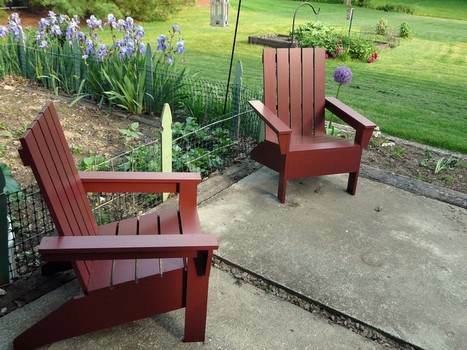 This is a great outdoor furniture project for a wooden chair and matching love seat. 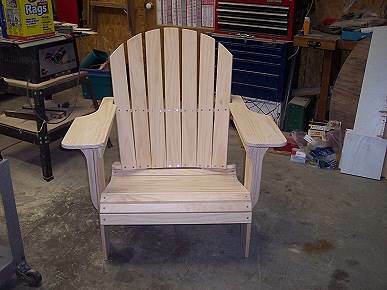 Build an Adirondack chair that is created almost completely using 1x4s and 1x6s. 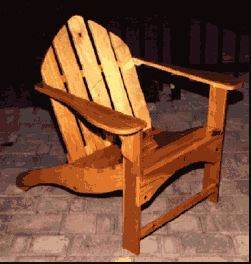 Here are video instructions on how to build this handsome seat for your patio or lawn. This chair is built with comfort in mind and you can build one or several using this chair plan. Here is a easy to follow plan for what will be your favorite outdoor seating built out of cedar. You can take this chair to the beach, park or wherever you go. It is built to fold up for easy transporting and storage. Here is a rocking chair built for two that gives comfortable support and relaxing rocking, so just sit back and enjoy.